10-8 Performance's aftermarket 1911 offerings are top notch. This 10-8 Operator was built in the Springfield Custom shop to 10-8's specs. Note the unique sight and trigger profile, and the angled magazine catch. 10-8 Performance is owned and operated by Hilton Yam, a SWAT operator with an elite law enforcement organization. 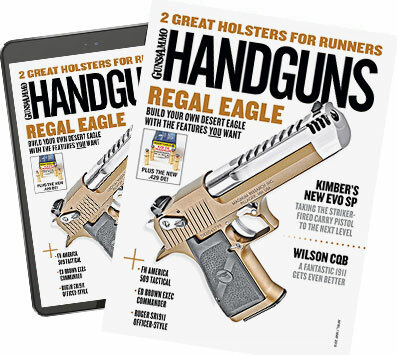 Hilton is also a heck of a pistolsmith with an eye for detail and the knowledge of what works and what doesn't that comes from seeing tens of thousands of rounds go downrange in real-world conditions every year. Hilton's hand-built 1911s have long-been in great demand. A few years ago, he realized he was never going to whittle that list down, so he quit taking orders to focus on designing 1911 parts. I've been using several of them for long enough to realize how lucky I am that Hilton got into the parts business. 10-8 Performance (10-8performance.com) is best known for its rakish rear sight. The sight is devoid of sharp edges yet has a scooped blade for manipulating the pistol on the edge of a ballistic shield or other flat surface. It is machined from 4140 bar stock for greater strength, and the rear blade is thick enough to accommodate tritium vials for those so inclined. I am most enamored with the sight's U-notch and serrated face, which I think provide one of the sharpest sight pictures on the market. In my opinion, the main advantage to the U-notch is speed. The sight picture seems less cluttered, and my eye seems to lock onto the front sight. Combined with a gold bead front sight, this setup is the cat's meow for both close encounters and long range work. Another interesting 10-8 part is a trigger designed by Yam and Larry Vickers. Based on the tried-and-true Videki design, it features a solid aluminum shoe, a full-width stainless steel bow and a fixed stainless steel overtravel stop. The trigger is available in standard and long lengths, as well as in a unique, flat version. I have small hands and am a big fan of short triggers. I was prepared to hate the longer flat trigger, but its flat face makes it feel shorter than it is. And because it's flat, it feels the same regardless of where your trigger finger hits it. This robust, no-nonsense trigger has become my all-time favorite 1911 trigger. Hilton also makes an attractive set of G-10 1911 grips. I like them, but I had to sand mine down a bit because they seem to be built for shooters with rawhide mitts or who work with gloved hands. If you're one of those guys, you'll love these grips. If not, a bit of fine sandpaper will get them down to just the right amount of traction to suit your needs. Once you get them where you want them, you'll see why so many operators are screwing these grippy stocks onto their favorite blasters. 10-8 Performance also offers a handy, no-mar armorer's tool. The soft, nylon tool has a rigid chisel point and a semi-flexible flat-blade end. The simple, inexpensive tool can be used to remove 1911 extractors, free a stuck extractor hook or to take down a Glock without marring your favorite pistol. Regardless of your favorite weapon platform, the Armorer Tool is a handy gadget for any gunny person to have around. The other 10-8 part I really like is its magazine catch. The slightly extended catch is angled so that it is shorter near the trigger and taller near the grip. It is easy to engage, yet not so oversized that you are likely to hit it inadvertently. My 10-8 Performance Springfield Custom Shop gun has the 10-8 catch, and I really like it. If you're a 1911 guy, take a look at 10-8 Performance's offerings. Its parts are designed and built for real-world conditions by real-world operators.